An Arduino based PID controller designed for use within my Gaggia Classic Coffee machine but also for a water bath for sous vide cooking. RTD100 temperature probe input with built in amp. support for a nokia 5110 LCD or an SPI display. Rotary encoder and 3 button input. 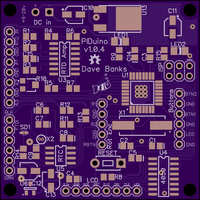 Currently I have just sent off the order to OSHPark.com and I am looking forward to the PCBs arriving. I have already ordered most of the parts from digikey. The project has been designed using DipTrace. Having tried eagle many years ago and having a quick go with both Eagle and Diptrace recently, I decided to go with Diptrace. It seemed better designed and the cost free limits involved seemed a lot more reasonable. 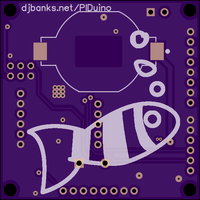 Warning: This is the first PCB I have designed for production and being mainly a software guy there may well be problems with it or bad techniques used. But I have to start somewhere! This is an Open Source Hardware project so you can freely download and use the files etc… I would really appreciate an attribution though.